V.com weekend vote: How long have you been playing your current instrument? October 21, 2016, 11:34 AM · How long have you been in a relationship with your current instrument? And I'm not asking how long you have played, but how long you have played the instrument that you play now. There is a difference! I was impressed with the story of Scott Slapin's 30th anniversary with his modern viola, a Hiroshi Iizuka. Now that is a long time! 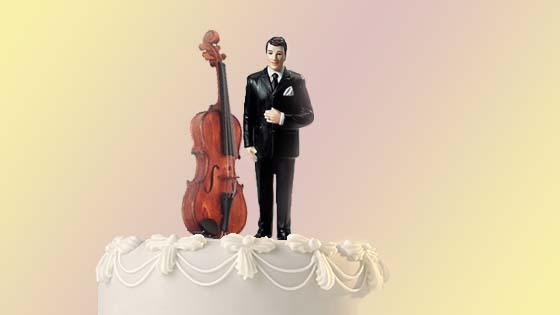 Taking on a new instrument is actually a pretty big deal, some might even compare it to a marriage! You make a commitment to that instrument, and then you keep it at your side. You work together, you take care of it, you create some beautiful moments together. There is a certain kind of ceremony to this union, and for me it's been different with each of the four major violins I've had. Early on, my grandmother gave me the "Strad," literally from her attic, an old German factory violin that had been in the family. It was a huge deal; she and my Grandfather personally drove it from Cleveland to Denver to put it in my hands (well, and just to visit us!). Still, the occasion had weight, and that violin was my partner in college and beyond. My next violin, a lovely modern instrument by David Scroggin, came from a local luthier. It had been made for someone else, and had amber crystals in the varnish, some funny stuff! This was a step up, and we also had many adventures together, until I fell head over heels with the violin I have now, a Gagliano brothers from the mid 19th c. A complicated marriage, there, involving the sale of my old instrument, a loan to be paid over years, etc. A huge commitment to a violin that I loved and still do. How long have you been with your current instrument? And what is the story behind it? October 21, 2016 at 07:15 PM · I choose 10-20 since while my current violin was around from when I first started (more than 30 years! ago) it wasn't "my" violin until I restarted playing back in 2002. The violin I learned on originally is now my back up. The story behind them is both simple and vague. They had been in my grandparent's closet in N.Y. since the 1930s until they were sent out to California following my dad's piano in 1972. October 21, 2016 at 10:24 PM · I voted 30+ -- that’s the timeframe for the current instrument I’ve had longest. The story behind it: Built by luthier Paul Pilat. Last line of inside handwritten label: “Dresden [Germany] 1869.” This is the third 4/4-size fiddle I’ve had -- got it while I was still in school. Previous owner had it for sale on consignment. Tested it, liked it a lot, and committed to it. But there are two other current fiddles -- purchased both in summer 2005. The stories behind them: One built in Frankfurt, Germany, 1883, by luthier J. Altrichter; the other built in France, 1921, by luthier Léon Bernardel. Had online dealer ship them here -- part of two separate 2-week tryouts involving four fiddles. I divide daily practice/play time among my three current fiddles. Since all three are, indeed, current, I guess this is a little like having three wives. October 21, 2016 at 11:05 PM · Norman Moor, When I was 16 my father bought me a John Walker (english) instrument actually from the maker himself who lived in Solihull near Birmingham in the UK. I have played it ever since and I am now 89 and still playing and teaching. I have tried others but each time my choice has been the Walker. Received it as a bday gift back in 98, and has been my only violin since then. Approaching 20 yrs. October 22, 2016 at 04:15 AM · I have been playing my #1 violin for over 30 years (actually over 50 years), and I love it more all the time. It was made some time around the year 1920 in Germany. It belonged to my violin teacher, who lent it to me when I was in high school. It had and still has a beautiful, warm sound. My family didn’t have enough money to buy a good violin like this. After I had played it for a few years, I told my father that I would be very unhappy when I had to give it back to my teacher. “You don’t have to give it back,” my father told me. “It’s yours now.” He had been paying my teacher a small amount of money every week for years. This violin is, in more ways than one, the greatest gift I’ve ever received. October 22, 2016 at 06:08 AM · Norman, if my math is correct, that is...73 years? I think you win the prize so far! Pauline, that is a really beautiful story. October 22, 2016 at 11:31 AM · I've had my violin for nearly 40 years. My parents bought it for me for my 10th birthday. It's a German violin made around 1890 - nothing special. I am a violinist by trade and I have looked several times to buy another instrument but I just cant find one. I've looked at really expensive Italian instrument, new instrument from some wonderful makers but just can't find anything to part me from my violin. I think there is something in the very special personal history that you share with your instrument that sometimes makes in irreplaceable. October 22, 2016 at 01:35 PM · The first violin I had was purchased with $2 bills I had saved back in 1950. Then I received a better violin with a beautiful case for Christmas that I named "Little Lord Fauntleroy". The next one was loaned to me and it was "Regginal". When I was in college I bought a violin by Koschate. I played on it for many years until I purchased a Vatelot French violin. I played on that for 30 years. It has a lovely tone, but I wanted a violin that had more presence in tone. So I just purchased a Paulus Pilat from Carriage Violin/Johnson Strings. It is 104 years old. They replaced the bass bar. It has a sound that carries and very beautiful appearance. I have not given unusual names to the last two violins. I guess I am over that part of my life. But will continue to play as long as my fingers and brain will work. I am 77 years young. October 22, 2016 at 07:22 PM · These are some seriously long-term relationships! October 23, 2016 at 02:51 PM · I fell in love with my violin when I was just tuning it up for the first time... I think I decided to buy it before I even played my first fingered notes. More than thirty years later, it's still 100% love, all the time. Feeling very lucky and grateful! October 27, 2016 at 02:38 PM · I have my first violin which I was given in 1936. It is a german factory-made instrument and is still in great shape - never a crack and very few signs of time. I have two other violins and rotate them while practicing. I am 91 - in case you are getting out the calculator. October 27, 2016 at 02:43 PM · I have had my first violin since 1936, It is a German factory-made instrument and is in remarkable shape. I also have two other violins and rotate them when practicing. I am 91- and yes I still work at it and and enjoy it more than ever.